Our residential service is second to none. The service that our employees provide is unparalleled. From our helpful girls in the office to the men who drive and pickup your trash, X-Cel Carting employees take pride in what they do. 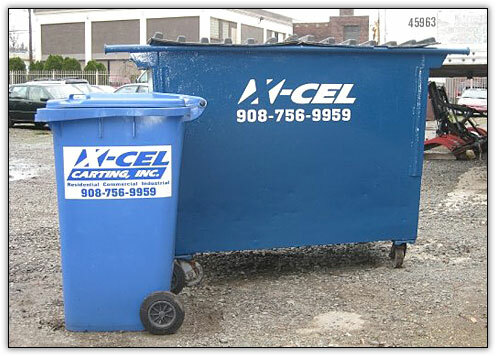 Whether one chooses our convenient driveway service or is one of our very many curbside pickups, each and every X-Cel Carting customer can rest assured that garbage is our very first priority. One should not have to worry about their disposal company missing pickups or articles of trash. Have an extra bag? No problem, X-Cel Carting will take it at NO extra charge. We do not nickel and dime our customers. We are very proud of the reputation that we have established and strive to continue that each and every day. Bulk pick ups are available, please call for pricing on specific items. Beginning in November of 2011, we will be adjusting our recycling days from every Tuesday to every other Wednesday. Your pickup day for your garbage has NOT been changed so please keep your regularly scheduled days. This is to more efficiently serve you. There will be no pickup on any of these days. If your pickup day falls on one of our scheduled holidays, your service will resume on your next scheduled pickup day.